The image of ISIS in the West is one of a distinct group, consumed by their own hateful, absolutist ideology. In many cases this may have some truth. Certainly, with recruits willing to come from as far away as Australia, the powerful effect of the group’s ideology is important. For many in Iraq, though, there is a degree of pragmatism in supporting ISIS. The harsh de-Baathification laws, a legacy of the 2003 Iraq war, left the Sunni population marginalized politically. Add to this the insecurity and historic fears of sectarian violence and increasing number of attacks by Shia groups, and support for ISIS can be seen as a rational choice for some Sunnis. Furthermore, there are many structural problems crippling the country. The effects of war have left many homeless, with 90,000 displaced by fighting in Anbar province in just the last few days; housing and infrastructure in towns like Tikrit has been laid waste; unemployment has almost doubled in the last two years to over 25 percent; the government has a huge budget deficit; and there is an ongoing dispute about oil revenues with Kurdistan. Serious economic problems, such as these, have historically been a breeding ground for ethnic conflicts. With Sunni, Shiite and Kurdish militias now heavily armed, there is the potential for sectarian and ethnic differences to continue violence in Iraq long after ISIS. So although military aid seems to be helping in the fight against ISIS, is it humanitarian and economic aid that may do more to securing Iraq’s long-term future through establishing the structural basis for a long-term peace. The US last week pledged $200 million in humanitarian aid but it is less than was sought by Prime Minister Abadi and other donors have been less forthcoming. In 1993, al-Douri was involved in the state-sponsored Return to Faith Campaign which sought to encourage devotion to Islam in Iraqi social life. This saw aspects of Islam fused into the Iraqi media, educational system and judicial system. Then in 2013, al-Douri addressed the Sunnis saying: "The people of Iraq and all its nationalist and Islamic forces support you until the realisation of your just demands for the fall of the Safavid-Persian alliance". 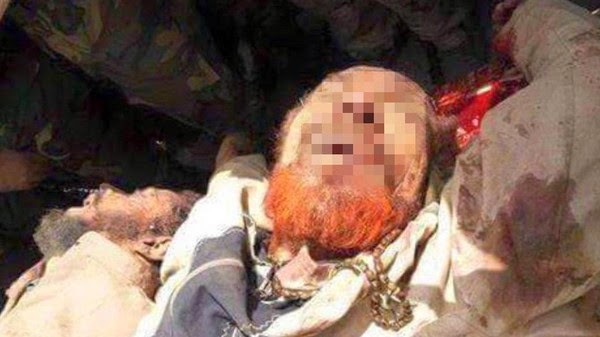 Al-Arabiya news station published a photograph which they alleged was of al-Douri’s body; DNA tests are underway to confirm the identity of the body as that of Izzat Ibrahim al-Douri. There have been no reports on the Naqshbandi website and the former Iraq Baathist party have released a statement denying the death of al-Douri. Following the 2003 Iraq war and the fall of Saddam, al-Douri spent nearly a decade in hiding, with many believing him to be dead, before re-emerging as the spiritual figure head of a movement dedicated to restoring the Ba'ath Party to power. The US set a $10m bounty on him. 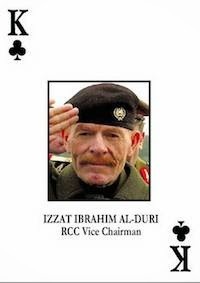 Izzat al-Douri was one of Saddam's most trusted aids, helping to lead his 1968 coup. Below is a list of the Leadership of the Army of the Men of the Naqshbandi Order with only Sheikh Abdullah Mustafa al-Naqshbandi remaining but little is known about his origins and whereabouts. Naqshbandi is a branch of the Sufi order, a mystical Islamic sect that touts Arab nationalism, as evidenced by its Baathist links and the Arab World-encompassing graphic on the group’s website. The Iraq Army are pretty stretched - and we are busy bombing shopping malls. What's 'normal'? The world appears no less 'normal' today than perhaps it's ever been. Perhaps it's even 'more normal' today than during the past century when tens of millions were killed in (non-Muslim) wars and incredible destruction occurred throughout Europe and many other places. Today, this very day, there's a Saudi-led 10-nation (sectarian Sunni Arab) coalition attacking Yemen. And a US-led 60-nation coalition confronting the likes of ISIS in Iraq and Syria, but with Iranian-backed (sectarian Shia Arab) militias. And there's the potentially earthshaking nuclear accord that could lead to Iran providing its substantial economic and cultural (think also food) capacities to an anxiety-ridden, volatile Middle East. Today, this very day, is a deadline. Perhaps. What is the purpose of degrading and destroying the likes of ISIS? If armed action does not allow IDPs to return to their homes to rebuild and restart their lives where they not only survive but thrive, then what good is it? What will it take to reestablish the communities IDPs called home? Removing the likes of ISIS is only a first step. There is, however, more preoccupation with weaponry and less appreciation for meeting high standards of planning and training -- too many assert that all that is needed is more weaponry and the war will be won. There is also inadequate appreciation for developing and maintaining high standard intelligence, surveillance, and reconnaissance (ISR) capabilities. How else to explain the failure of tens of thousands of anti-ISIS forces to dislodge a few hundred ISIS fighters in Tikrit? Irregular Iraqi sectarian militia forces unregulated by government far outnumber ISIS forces, some say 30,000 against 400. The militias are materially supported by the Iraqi government but act outside government command and control. In effect, they are public-supported, private (nongovernmental) militias (gangs?). These militia forces are less organized, less disciplined, less trained and lack ISR capabilities of well-established, well-trained, and well-led military units. Numerous reports indicate they are guided by Iranians with assistance from Lebanese Hezbollah. Similar to the media confusion about what to call the likes of ISIS -- Daesh, ISIS, ISIL, or IS -- these sectarian (Shia) militia groups are sometimes referred to as Popular Mobilization Units (PMUs), or Popular Mobilization Committees (PMCs), or Popular Mobilization Forces (PMFs). Incidentally, during the mid-1990s in the Kurdistan Region a PMF was established in Erbil to monitor an internal ceasefire. It was led by the Turkish military and included local forces. Though this PMF had nothing to do with the UN, the Turkish military wore the blue berets of UN peacekeeping forces. This PMF was eventually disbanded. If central/federal government supported forces are unable to retake Tikrit, then how will they ever retake Mosul? And it's really not about retaking ISIS-controlled territory. If successful, it's really about what happens AFTER the retaking. Sectarian militia forces threaten Sunni and other non-Shia inhabitants of areas under ISIS control. Some Sunni areas retaken by these militias are uninhabitable by the original inhabitants who are unable to return. In other words, though ISIS has shattered what was left of the Iraqi state, the heavy-handed, revengeful behavior of sectarian militias against the likes of ISIS is reinforcing the shattering. For example, Jurf al Sarkhar. Iraqi Prime Minister Haider al Abadi proclaimed its liberation to be "a key to liberate every corner of Iraq." He called it a victory against ISIS, and said it was a morale booster for Iraqi forces. But Jurf al Sakhar is a relatively small place that is now, after "liberation", uninhabitable by its original citizens. Under what conditions will IDPs be able to return to their homes? What needs to be achieved to regenerate those conditions? What's the roadmap and timeframe? Degrading and destroying the likes of ISIS is only a first step. TIKRIT, Iraq — Iraqi officials insisted for weeks that Islamic State fighters had been all but exterminated in Tikrit, confined to a few pockets in the city center. Yet on Sunday, military officials in the city were reluctant to allow journalists to head back to Baghdad by road — even though the highway skirts Tikrit well to the west. The supposed safer alternative was a general’s Iraqi Air Force Cessna waiting at the Tikrit Air Base nine miles northwest of downtown. But before takeoff, two mortar shells slammed into a grassy patch between the airfield’s two runways, within 100 yards of the small plane. Iraqi military escorts surmised that the person shooting had to have been within visual range — and probably to the west, although downtown was southeast. “Daesh are everywhere,” one senior officer said, using the Arab nickname for the Islamic State, also known as ISIS or ISIL. During a two-day visit to Tikrit, a strategic city in Iraq’s central Sunni heartland, it was clear that after four weeks of the government offensive the Islamic State’s fighters are more numerous and still hold much more territory here than officials had previously allowed, even with heavy American airstrikes added in. According to Iraqi military officials and fighters on the ground in Tikrit, ISISstill dominates or controls about 20 square miles of the city, everything from the edge of Tikrit University in the north, to the far end of the New Ouja neighborhood in the south, a distance as much as eight miles north to south. That encompasses most of the populous parts of the city, which generally lie west of the Tigris River; all of its main downtown and business districts; the government quarter and the former palace of Saddam Hussein. Government forces remain mostly east of the Tigris, an area that is predominantly rural and agricultural, or on the suburban or rural outskirts of the city on the western and southern sides. The city’s population used to be more than a quarter million, but most residents have fled. The army headquarters for the operation are situated at a campus building not far from the front line with ISIS — though here, front line is a relative term. Eight mortar tubes were set up around the headquarters to provide defense, and they were pointing not just south toward the center of Tikrit, but also to the north and northeast. Those mortars were all fired relatively frequently Saturday and Sunday, their shots alternating with the ground-shaking blasts of bombs being dropped from time to time by coalition aircraft. Lt. Gen. Abdul al-Wahab al-Saadi, the commander of the Tikrit offensive, said that while the Iraqi military’s positions around the city had not changed significantly, special operations forces and elite police units were carrying out reconnaissance in force into the city and had penetrated to within 600 yards of the government complex in the city center. He said the going had been slow because at first Iraqi forces wanted to leave space for civilians to flee the city, and then wanted to proceed in a way that kept casualties among the military and its allied Shiite militias as low as possible. Despite weeks of fighting, he insisted that the pro-government forces had sustained few fatalities, and estimated that ISIS had 450 to 750 fighters left in the city, and had lost an equal number killed. Shiite militias were losing about an average of eight fighters a day killed, according to cemetery workers in Najaf, where most Shiite martyrs are buried. While that was a nationwide estimate, most of them would have been fighting in Salahuddin Province. But Wafiq al-Hashemi, director of the Iraqi Group for Strategic Studies, an independent research organization that often provides advice to the Iraqi government, said his estimates of ISIS fighters still active in Tikrit were in the range of 2,000 to 3,000. He also said that not only did ISIS still dominate the 20-square-mile area between Tikrit University and Ouja, but that the Iraqi military still had not succeeded in taking control of Highway 1 north of Tikrit, between Tikrit and Mosul, where ISIS has its major base in Iraq. The militants in Tikrit have been able to keep using that supply line to the north even though they are surrounded within the city, using tunnels to evade government lines and keep access to the road. “The government cannot do it unless the international alliance keeps up these airstrikes,” he said. According to Gen. Lloyd Austin, who as head of the United States Central Command is in overall charge of the coalition in Iraq and Syria, the Iraqi military has about 4,000 troops under its command in Tikrit — far less than the 30,000 figure Iraqi officials had cited, although that included militia forces as well. He insisted that the Shiite militias were not involved in the Tikrit battle any longer, after the American military told congressional leaders last week that it had agreed to support Iraqi operations in Tikrit with airstrikes only after being assured that Shiite militias, many of them with Iranian advisers, had been pulled out of the fight. There was considerable confusion in Tikrit, however, over the new terms of engagement. While some of the militiamen said they would pull out of the fight, many others could be seen on the front lines of it. In addition, many new militia fighters, officially known as the popular mobilization forces, were seen arriving in significant numbers in Tikrit on Saturday and Sunday. However, Iranian advisers who had been working with some of the militias, in particular, have no longer been reported on the battlefields around Tikrit and elsewhere in Salahuddin Province. On Sunday, about 60 Shiite fighters arrived at General Saadi’s headquarters from the Shiite heartland around Karbala as part of a militia called Qataba Imam Ali, wearing black uniforms with body armor and carrying a mixture of light and heavy weapons. Their commander was Lt. Col. Salim Mizher, who said his men were eager to join the fight. But when an Iraqi officer, Brig. Gen. Abbas Khudair, explained that the militiamen were being incorporated into the army and would not operate independently, answering to Iraqi generals, Colonel Mizher objected. “We answer to Sheikh Maithan and no other person,” he said, naming one of the militia’s religious leaders. Of course, the actions of ISIS have been fuelling sectarian fears and divisions. In June 2014, an ISIS twitter feed displayed pictures of hundreds of dead Shiites in Tikrit, surrounded by their ISIS killers. It is therefore inevitable that the thought of large Shia militias entering Tikrit provokes worries of vengeful, sectarian violence - particularly in the light of recent examples such as the execution of the young boy. The behaviour of the barbarian organisation known as Daish or Isis is known to all and we can expect nothing better. Nothing excuses the brutal atrocity illustrated by the treatment of journalists and aid workers by Isis. Excessive collateral damage from bombing as in Jurf Al-Sakhar. Though bombing has been a vital weapon in curbing ISIS expansion, it must be a tactic employed with far greater caution or it may become counterproductive (as have been the Yemen drone strikes for example). exhibition which documents the curse of oil. The exhibition at London’s P21 Gallery brings together a collective of artists: nine from Iraq and two from the United Kingdom (Ala Bashir, Andrew Smith, Bassim Mehdi, Hani Mazhar, Jalal Alwan, Mariwan Jalal, Mohammed Ali Dawood, Raid Houby, Richard Janes, Soodad Al-Naib and Zina Al-Jauari) to creatively explore some of the ways in which oil has ruined our humanity. This is especially the case for those living in nations with an abundance of oil, like the peoples of the Middle East, who have been subjected to foreign wars, invasion, occupation, authoritarianism, sanctions, shock and awe – the list goes on. Apart from one of the installations with a pink balloon which represents the dreams of a child standing up to announce hope, all the works portray pain, suffering, crushed human beings, and human beings portrayed as the victims and slaves of oil. The oil barrels evoke the immense power of energy and the mannequins symbolise what this deadly force has done to human beings, not to mention the environment. The first installation Slaves outside the entrance to the gallery by Andrew Smith was inspired by Michaelangelo’s slave works. The figure is crafted from polystyrene, a product of the oil industry embodying our enslavement to the power of oil. “The figure is large, larger than the barrel. However despite out obvious strength, we are still mere slaves to the power of oil,” Smith, a monumental mason turned sculptor explains. Richard Janes real size oil barrel in an untitled work, shows three bronze figures bound by the barrel sections supporting it but trapped, representing three world: first, second and third. “While this classification and definition of development and political division is contentious, in my work it is meant to be inclusive. All the world is reliant, beggared and trapped by oil,” Janes said. The final installation Descend Into the Abyss is on the steps leading out of the gallery. Raid Houby explains that in an ideal world, because humans are precious the environment should serve our needs. But while energy is one of those assets that supposedly serve human needs, humans have become the cheapest assets, assaulted for the sake of energy. The P21 Gallery is an independent London-based charitable organisation established to promote contemporary Middle Eastern and Arab art and culture. The two-story venue in central London has been recently designed by the award winning Egyptian architect, Professor Abdul Halim Ibrahim, as a place where contemporary artistic statements are experienced and appreciated by a global artistic community. The facilities at P21 are planned to maximise the potential of contemporary art as a discourse, through multimedia exhibition spaces on two levels with supporting facilities for public functions and workshops for training and education. In addition, the P21 Gallery hosts a reference library, meeting rooms, a lecture hall as well as a specialised café and provides for a much-needed meeting place in the heart of London. A senior member of the NCF writes: Accusations that Qatar has helped support a spectrum of Islamist groups by providing safe haven, diplomatic mediation, financial aid and, in certain instances, weapons keep growing. This issue escalated during a recent visit to Doha by three of Saudi Arabia's most senior princes -- the ministers of foreign affairs, interior, and general intelligence. With the U.S. now committing itself -- along with a still not fully confirmed list of allied powers -- to limit and ultimately destroy the Islamic State (IS) 'proclaimed' on 29 June, the pressure on Qatar to put more 'actions' behind its 'words' abhoring the activities of the IS and its extremist supporters will increase accordingly. Sheikh Ajmi and at least a half-dozen others identified by the United States as private fund-raisers for Al Qaeda’s Syrian franchise operate freely in Doha, often speaking at state-owned mosques and even occasionally appearing on Al Jazeera. The state itself has provided at least some form of assistance — whether sanctuary, media, money or weapons — to the Taliban of Afghanistan, Hamas of Gaza, rebels from Syria, militias in Libya and allies of the Muslim Brotherhood across the region. Propelling the barrage of accusations against Qatar is a regional contest for power in which competing Persian Gulf monarchies have backed opposing proxies in contested places like Gaza, Libya and especially Egypt. In Egypt, Qatar and its Al Jazeera network backed the former government led by politicians of the Muslim Brotherhood. Other gulf monarchies long despised the Brotherhood because they saw it as a well-organized force that could threaten their power at home, and they backed the military takeover that removed the Islamist president. Following mounting pressure on Nuri al-Maliki from various sources including Iran, U.S., Ayatollah Sistani and his own party, Hezb al-Dawa, he has today stepped down as Iraq's Prime Minister, making way for Prime Minister-designate Haider al-Abadi to become the leader. Al-Maliki had previously refused to step down after al-Abadi was nominated, saying in a televised address Wednesday that the appointment was a constitutional violation. Nothing was said as to his terms. Heitham al-Jabouri, the speaker of the Alliance for Legal Government, revealed that al-Maliki and al-Abadi had agreed on the transfer of power in Iraq. Ali al-Mousavi, Maliki’s advisor, also announced that Maliki has given up his legal case against Foaud Masoum, the President of Iraq, in the Iraq Federal Court. Ayatollah Sistani had very specifically asked for a new prime minister. Losing the backing of Iran, Sistani and the United States seems finally to have convinced Maliki that he had to give up his hold on power. And even Asa’ib Ahl Al Haq (de-facto Malaki’s militia) now back Abadi (though individual fighters may not do so in some instances). Al-Abadi has the support of Iran, U.S.A. and Saudi Arabia. We live in hope that this is not just a milestone, but a pivotal moment in broader regional peace. Things remain as dangerous as ever in Iraq. Part of the problem is the flexibility of IS. When IS is attacked in a counter-insurgency move in one place, they fight back somewhere else. We must correct an item in our last report. We implied that the government held Jurf Al-Sakhar fifty miles south of Baghdad in Babil Province. This is of course incorrect. IS still holds Jurf Al-Sakhar. We do not use press reports as sources but regrettably some of the sources we use are themselves influenced by reports that minimise the strength of IS and inflate the strength of the Iraq Army. Sometimes the Iraq Government itself does not know what is going on as spokespersons fall into the trap of believing their own PR. Certainly Baghdad itself is quieter. Though there have been a lot of bombings, including one near Haider al Abadi’s home in Karada. People are angry at the Iraq Security Forces for their failure to keep things under control. “The numbers being thrown around are being questioned. Numbers from Kurdistan sources are too often highly exaggerated. While initial estimates may make some sense under the circumstances, later updated figures often do not lead to revisions in initial figures. A rule of thumb is to cut them in half and go down from there. “For example, the number of Yazidis in Iraq is often said to be 500,000. Vian Dakhil, the Yezidi MP who made such an effective impassioned plea, said in an interview with Dutch media there are 300,000. There aren't many Yezidi population centers. 500,000 suggests 10 cities with 50,000 Yezidis each or 100 villages of 5,000 each. Neither makes sense." The following information has been provided largely through Kurdish sources. The situation is fluid and intense, to say the least. One problem facing the Kurdistan Regional Government is a shortage of money to address its mounting responsibilities. There is a real concern being expressed in Arbil that -- despite the will -- available foreign exchange might soon dry up in the local banking centre if new infusions of cash are not received. This would affect the ability of the Kurdish Regional Government to pay the salaries of civil servants and even the vaunted Pershmerga militia fighters. One reason for this problem is that a dispute over oil has caused the central government to stop all payments to the KRG. That Baghdad would devote time and money to preventing the KRG from independently recovering even a small fraction of what it is owed is inexplicable, especially as the federal government fights a massive insurgency by IS and struggles to maintain its own institutions. Hopefully, the incoming administration of prime minister-designate, Haidar al-Abadi, will reverse this situation and seek to address Kurdish (as well as Sunni) grievances. The NCF met al-Abadi a few weeks ago and was impressed. He takes a no-nonsense view of Kurdish efforts to extract money from the central government while seeking an independent source of income abroad. However, he is far more flexible than his predecessor, Nuri al-Maliki, who continues to resist his replacement at the time of this writing, despite his rapidly diminishing support. Refugees - those the UN disingenuously calls internally displaced persons (IDPs) - continue to flood into the Kurdistan Region, with estimates at well over one million people in need of critical humanitarian aid. This number will only rise as Yezidis from Sinjar continue to be rescued and brought to the Kurdistan Region for medical attention. Immediate humanitarian aid, in terms of food, water, housing, medical supplies, and funds, is desperately needed. Prior to the Islamic State's (IS) offensive in Sinjar (Singal) and theNinevah (Ninawa) Governorate, the Kurdistan Region hosted nearly one million refugees and IDPs. Makhmour town and the surrounding villages are back under Peshmerga control after four days of fighting (Makhmour District is in the extreme South of Arbil Province and is technically part of the disputed territories)The town Gwer, also in Makhmour District, located about 25 miles southwest of Arbil, is also under Kurdish Peshmerga control again. These efforts have been aided by US airstrikes, although continuous air support is necessary in order to hold these towns. Lufthansa have cancelled flights to Arbil leaving MEA, Turkish Airlines, and Royal Jordanian as the only three major carriers operating to Arbil. The US Consulate in Erbil remains open and operational, although some non-essential staff have been relocated. IS remains in control of Christian towns and villages including Qaraqosh. IS fighters still control Tel Afar, Tel Keyf, and other towns in Ninevah Governorate. Sinjar district, still under IS control, is the scene of fierce clashes with Peshmerga. Limited airstrikes by the US military are taking place in and around Sinjar, in support of Kurdish Peshmerga operations to maintain a corridor to evacuate civilians, and a limited number have been escorted to safety. A massive air search and rescue is also underway to locate civilians stranded on Mount Sinjar. The Sinjar mountain range stretches almost 50 miles along the Iraq-Syrian border and is 3,000 foot high at its highest point, with extremely rugged terrain. Between 30,000 and 40,000 refugees (predominantly but by no means exclusively Yezidis) are estimated to still be on the mountain (some press estimates of numbers approaching 100,000 are not credible). Hospitals and clinics in the Duhok area have received thousands of rescued Yezidis, with over 100 doctors volunteering for the relief efforts. Unimaginable atrocities continue to be committed against Christian and Yezidi minority populations throughout Ninevah Governorate. In Sinjar, An indeterminate number of Sinjar women captured by IS have been relocated to Mosul and are being forcefully married off to IS militants. The US military has been conducting airdrops of food and supplies on Mount Sinjar since Thursday. It has been reported that these were dropped from a great height which would seem to negate or seriously reduce its actual effectiveness. France, Canada, Italy, Germany, and the UK have also pledged to support humanitarian relief efforts. On Sunday August 10, the United Kingdom began with an initial airdrop of food and supplies over Mount Sinjar from two British C130s. The UK has pledged to contribute a total of £13 million for refugees and IDPs in Iraq. The most immediate direct threat facing the area is IS control over Mosul Dam, putting the group in control of the most substantial water and electricity asset in the region. The dam is poorly constructed and aging, and requires regular maintenance to prevent catastrophic failure; a 2006 assessment by the US Army Corps of Engineers called it "the most dangerous dam in the world". IS has claimed that they will destroy the dam if they lose control of the area. Such an event would send a wave 63 feet high through the city of Mosul, and cause widespread flooding along the Tigris, one of the most densely populated regions of Iraq. Baghdad would also experience serious flooding. Analysts estimate over half a million people would be killed. In an exciting development, Haider al-Abadi, who is a senior member of the Islamic Dawa Party, has been asked to form a government by the Iraqpresident, Fouad Massoum. Mr. Abadi now has 30 days in which to form a government. During that time, Mr. Nouri Al-Maliki will remain as a caretaker leader, and as commander-in-chief of Iraq’s security forces. There have been fears expressed that Maliki may attempt a coup d'état to retain power, but in the unlikely event that should happen, that seems impossible to succeed. Maliki sped up his demise by an ill thought through show of force last night, which galvanised many against him this morning, including much of his own bloc. Maliki tonight gave a speech assuring the security forces that he'll reverse this “error” calling it unconstitutional. The army twitter account, however, tweeted earlier that it's “Iraq's army not Maliki's...” There was a pro-Maliki demo in Baghdad today, with an embarrassingly small number of people who had all been bussed in from the provinces, paid and given free food. The situation in Baghdad is tense, with army troops on high alert. 1. On Kirkuk: Al Abadi favoured giving special status to the province. 2. Electorally he favours the ‘top-up’ system promoted by the UN back in 2010 that strongly favoured the largest parties. Rather than the present system of PR that gives a distinct advantage to the mid-weight parties. 3. He regards corruption and bureaucracy as two of Iraq’s key problems. 1. That he is made either Vice President or Minister of Interior. 2. Nouri Al-Maliki also asks for a personal guard of at least 2,500 soldiers under his direct command drawn from the Baghdad Brigade of the Iraq Army. However, other members of the Shiite alliance say such demands “Can’t be taken seriously”. The new Premier has only one month in which to form a government. But members of the Shiite Alliance point out that 130 Shiite Alliance MPs agreed to the nomination of Haider Al Ibadi “without preconditions”. President Barack Obama called to offer his support to Haider Al Abadi, and urged him to form an inclusive government, he said Monday afternoon. "Today Iraq took a promising step forward" in the effort to create a new government "that can unite Iraq's different communities," Obama said from Martha's Vineyard, Mass. On other developments – we have been reliably made aware of the fact that casualty claims from various parties with regard to air strikes made by US / Iraq Army forces in Northern Iraq have been grossly incorrect in most instances – we therefore advise all journalists associated with the NCF not to report casualty figures unless they have their own credible sources independent of any government. UN casualty figures for Iraq have also now been utterly discredited. They are far too low. Our own sources indicate almost 4,000 dead in the past week alone. As regards the on the ground position – there is now fighting on so very many fronts that we can no longer list all the battlefronts – at least not at the moment. President Masoud Barzani of Kurdistan wrote an editorial in today’s Washington Post begging for more military aid to help the Kurds fight IS.